Wishful thinking is a common theme with conceptual EA Sports game covers; usually the artist is honoring a favorite player or another star he wishes would be anointed for cover recognition. Entirely imaginary titles, as conceived here by an artist and posted on Behance, are a little less common. 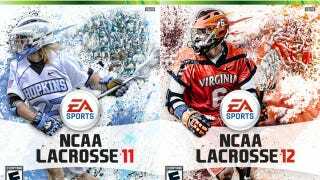 No NCAA Lacrosse title by EA Sports exists and odds aren't good that it will anytime soon. Yet I wonder if this artist realizes there are in fact, currently available versions of both the professional and collegiate forms of lacrosse, for the Xbox 360. In fact, College Lacrosse 11 and NLL 11, by Crosse Studios, both had releases in 2010. That means lacrosse is a licensed, annual sports video game, which makes it mainstream enough not to need fictitious covers, really.